The following is a contribution from our friends at The Penny Hoarder. Tax season is upon us, and not everyone has filed yet. With the April 17 due date looming, some of you still might not be sure if you should file taxes online or pay a tax professional to do it for you. The answer to this question will differ depending on your circumstances. While there isn’t an exact right answer, there are some general rules about when it’s best to DIY your taxes and when you should hire a professional. I spoke with Michael Ryan, a Tampa Bay-area staff accountant, who’s been in the field for 26 years, to get his opinion. Here are six times you should hire a tax professional. For instance, with marriage, you have another income source to account for if your spouse works. Having kids adds dependents to your tax return, and also qualifies you for certain dependency-based deductions and tax credits. These life events will all affect your tax return in different ways, so it’s best to leave it to the professionals. They have extensive knowledge on how to claim certain income sources, and which deductions or tax credits you might now be eligible for. If you filed your taxes after a major life change, you might miss out on money that’s owed to you, or credits you didn’t know about. Ryan says it’s important to use a tax professional if you, or someone you claim as a dependent, is in college for the first time. This is because there are certain education-related expenses you can write off that most people might miss. Your college will send you basic information for your taxes, like tuition paid, or any scholarships or grants you received. But the average person might overlook available write-offs, such as books, additional fees or special supplies needed to take a course. On the flip side, you might learn certain expenses you tried to write-off as education-related (i.e. parking passes, room and board, or meal plans) don’t count. Personally, I’m thankful I used a tax professional for my taxes this year. I qualified for a pretty hefty education credit I wouldn’t have known about otherwise. Some companies will hire you as an independent contractor, rather than an employee. This is common with work-from-home jobs and virtually any side gig. It’s great to earn extra income on the side, but being an independent contractor means you’re responsible for your own taxes. I’ve had too many friends fall victim to this, and then realize a little too late they owe thousands in taxes once they file for the year. A tax professional is important here because there are tons of deductions easily overlooked when you file your own taxes online. “Any cash spent to generate income is deductible,” Ryan explains. Some of the most common expenses that get overlooked? Mileage to and from the post office to mail an invoice or work-related document, mileage to the bank and back to deposit a check, supplies needed to complete your work, and even your home office space. These are just a few of the many deductions you can write off as an independent contractor. Income tax laws vary by state. It can get a little messy if you reside in one state but work in another, or if you’ve worked and earned income in multiple states. While this might not be as common for most people, a lot of college students will live in one state, but go home for the summer and work at a job in an entirely different state. A tax professional can help you with the varying income tax laws, and perform what is required for each state tax-wise. Whether you’re in retirement or only a few years away, it’s important to consult a tax professional, especially if you plan to retire in another state or foreign country. Tax laws will vary whether you’re moving across the country or around the world, and you need to know how those taxes will affect your nest egg. When you file your own tax returns, the IRS is allowed to challenge what you report and impose additional taxes for up to three years after the filing date. For under-reported income, the time frame for challenging rises to six years. Even if you aren’t purposely under reporting your income, you’ll still be held responsible for any information you submit when you don’t use a tax professional. When you hire a professional, they take on that liability. Clearly, they’ll want do everything 100 percent right. Managing your money on a daily basis isn’t always easy, and hiring someone who knows what they’re doing will help take that stress off you. Choosing to hire a tax professional makes sense if you have a complicated tax return or just went through a major life event. Although a professional can cost hundreds of dollars, they’ll save you money in the long run since they know the ins and outs of tax laws, deductions, and credits. If you filed your taxes incorrectly and didn’t write off everything you could’ve, you’ll end up paying more in taxes anyway. Do you prefer to hire someone to do your taxes, or do you prepare them yourself? What are you planning on doing with your refund, if you receive one? Have you filed your taxes yet? Jacquelyn Pica is a junior writer at The Penny Hoarder. Find her on Twitter @JacquelynTPH. 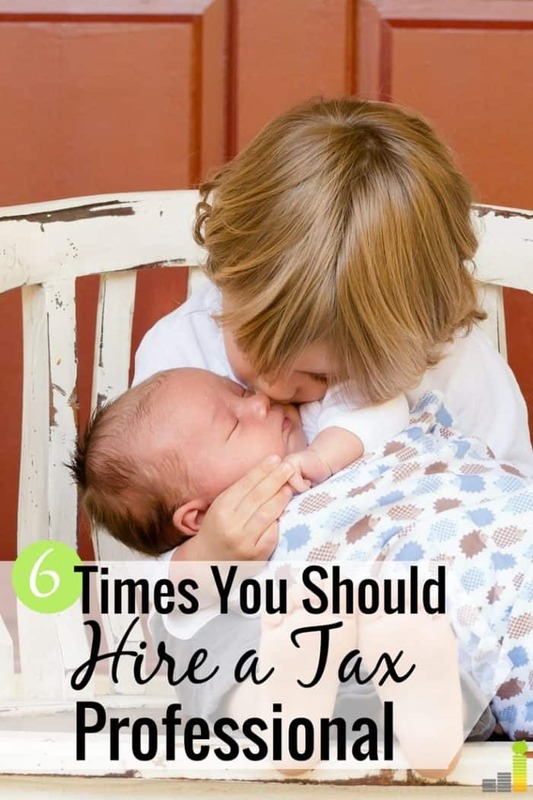 The post 6 Times You Should Hire a Tax Professional appeared first on Frugal Rules.